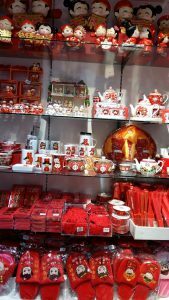 Traditional Chinese weddings requires specific items like a new tea set (used for the tea ceremony), red ang pows, wedding themed soft toys, plates, ribbons, slippers and even a red potty. Prior to a wedding, an auspicious date would need to be set, taking into account the birth date and time of both the bride and groom. 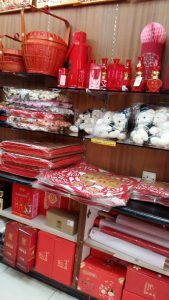 Generally, Chinese weddings would be held from the 8th month of the Chinese lunar calendar (sometime in September each year) and stretched to about Chinese New Year. During these ‘peak months’, Chinese restaurants and hotels, especially those famous for delicious Chinese cuisine would be fully booked on weekends (for convenience, Chinese wedding lunches/dinners are generally held on weekends or public holidays). Many elders would still expect the traditional custom of a Chinese wedding to be followed, hence it would involved purchasing a number of items to be used during the wedding ceremony. If you are staying in Klang Valley, generally Petaling Street (Chinatown KL) would be the usual place to look for these items. I have came across at least 3 shops around Chinatown area that carries these items. Above: You can also see photo frames and they also sell guest registration book (the kind where guest register during wedding dinners). 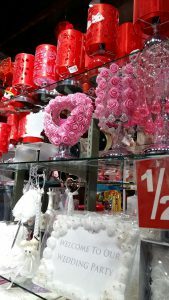 I used to visit Nam Thong since I was young- in the past they sold endless collection of beads and ribbons but the items have reduced and they have since focused on other items like seasonal decorations and wedding items. Aside from Chinese wedding items, this shop also sells a lot of beads and craft supplies (similar to Macy). It is actually located same road with Macy and Nam Thong….just that you need to walk further down the road against the traffic direction. 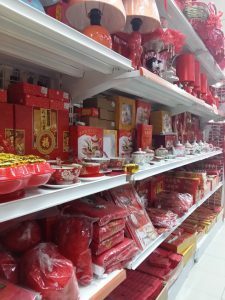 For Petaling Jaya, you can also visit Syarikat Sin Wah …..who just opened another outlet nearby that also sells gifts and Chinese wedding items. According to the lady who is manning the store, she informed me that previously the items were located upstairs of Sin Wah in which was infrequently visited. They took over another shop few doors away which previously sold Chinese medicine.